The above info came from Jehue Diedric, and was edited by yours truly (contact me). The image came from world-art.ru. 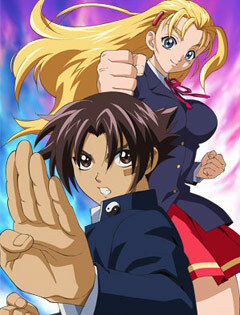 Shijou Saikyou no Deshi Kenichi is about a boy called Shirahama Kenichi who was once picked on by his classmates in middle school. Eventually he meets a girl called Furinji Miu who is an excellent martial artist and who's grandfather owns a dojo called the Ryouzanpaku. This dojo is the home of martial arts masters such as the mui tai boxer Apachai Hopachai, the weapon specialist Kousaka Shigure, the Chinese martial artist Ma Kensei, the karate expert Sakaki Shio, and the Jujitsu master Koetsuji Akisame. Shirahama then decides to go to this dojo and train so he could shed the nick name "Weak Legs", which had followed him since middle school, and protected the weak. However, he soon finds out that being strong isn't going to be easy. The above description came from Jehue Diedric, and was edited by yours truly (contact me).